I have made and shared a lot of treats with friends and coworkers over the years, and besides my go-to oatmeal chocolate chip cookies, these salted caramel brownies have been the most requested recipe of all of them. When I first started brainstorming recipes I knew I wanted a chocolaty treat for Valentine’s Day. 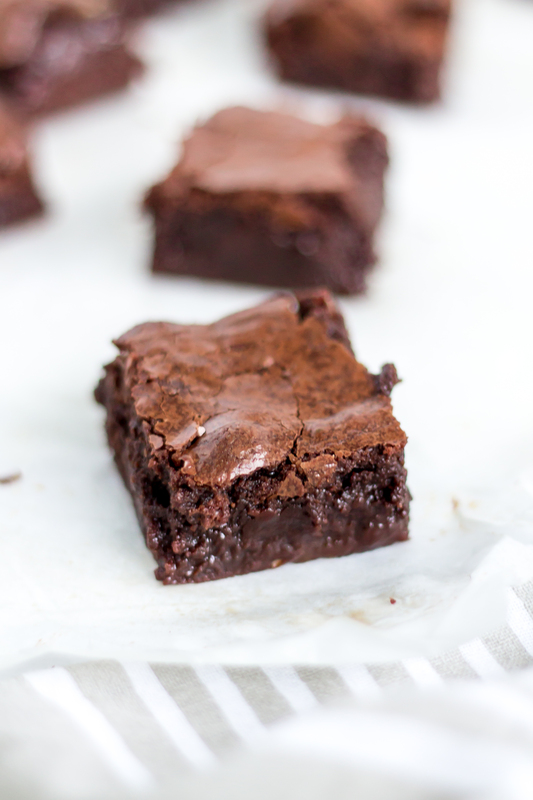 Homemade brownies are one of my favorite desserts, but seemed a bit plain-Jane for a special occasion. To enhance the already delicious deep chocolaty brownies, I made salted caramel to mix into the batter. The result was even better than I expected, with caramel pools on top of the crackly, fudgy brownies and a chewy caramel base. 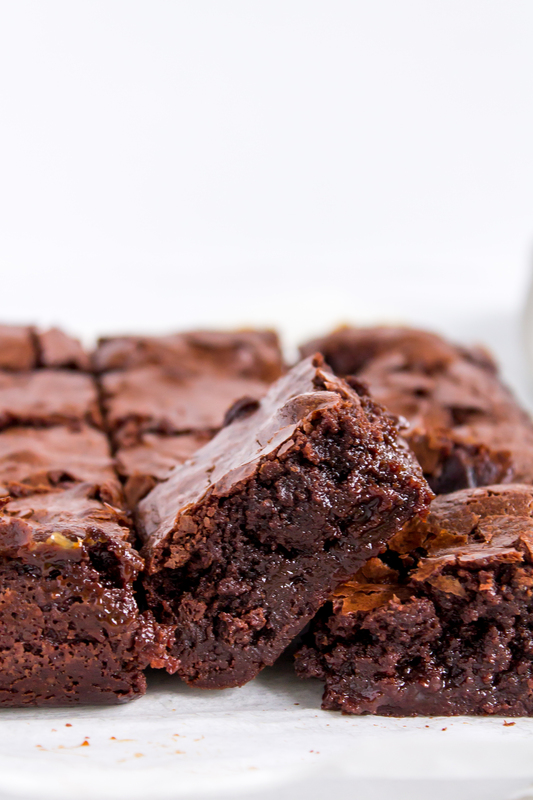 The salted caramel is addictive on it’s own, the fudgy brownies are a chocolate-lovers dream, and the marriage of the two is a match made in dessert heaven. 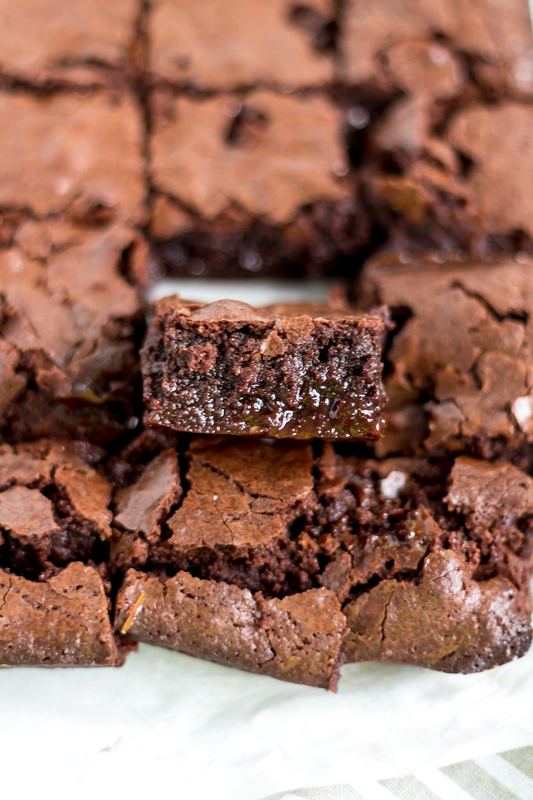 Salted caramel brownies are truly decadent. They are the type of treat that is so rich that you can only eat a small bite. What better for Valentine’s Day though? Fudgy, chocolaty, caramel goodness – I can’t think of many things that would beat that. The perfect combination of salty and sweet makes the dessert even more delectable. With only a few ingredients and a little hands-on time, caramel is easier to make than you may think. After testing this caramel once, I made a crucial mistake the second time I tried to test it by not returning the pan to the stove to heat after I added the cream. The caramel, while still delicious, was much softer and didn’t form the puddles that we get in this version. Learn from my mistakes and cook the caramel a little longer after you stir in the cream. To make quick work of the recipe, make the caramel first, and let it chill while you make the rest of the delicious brownies. Salted caramel brownies are chocolaty, fudgy, caramely and delicious, with a hint of sweet and salty, perfect for your Valentine’s Day celebrations. Place a piece of parchment paper on a baking sheet and set aside. In a medium saucepan over medium-high heat, melt your sugar, stirring every now and then to break up any chunks. This will take about 5 minutes. Continue to cook until it is a copper color. Remove it from the heat and stir in the butter. It may not incorporate fully but give it your best shot. Add the cream and salt to the mixture and stir to combine. Return the saucepan to the stove and cook over medium-high heat, bringing the caramel back to a simmer to melt any sugar that solidified. Cook the simmering caramel for a few minutes more, until it is one shade darker. Pour the liquid onto your parchment-covered pan and place it in your freezer. Freeze until the caramel has solidified but isn’t hard, about 20 to 30 minutes. Preheat the oven to 350 degrees F. Line a metal 8×8-inch baking pan with a sheet of parchment paper so that each side of the parchment hangs over the edges of the pan. Coat the pan and parchment paper with non-stick cooking spray. In a small saucepan over low heat, melt the butter and chocolate together, stirring frequently. Once the mixture is melted and smooth remove the pan from the heat. Add the sugar and brown sugar to the melted chocolate and butter mixture and whisk to combine. It will be grainy at this point, but will smooth out later. Whisk in the eggs and egg yolk, one at a time, then add the vanilla. Whisk for about one minute. At this point the mixture should become smooth again. Stir the flour, salt, and baking powder into the wet ingredients. Fold in most of your caramel bits, leaving some for the top. Spread the batter evenly in your prepared baking pan and place the rest of the caramel squares into the top of the batter. 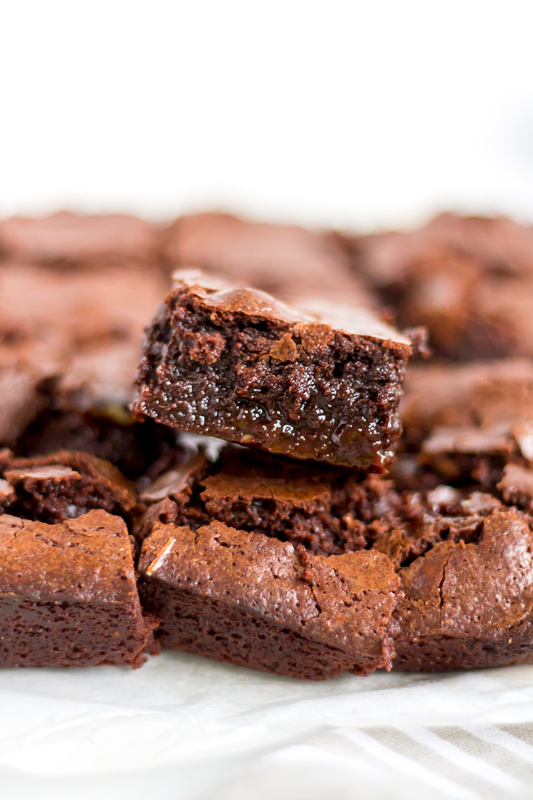 Bake the brownies for about 25-35 minutes, or until a toothpick inserted into the center of them comes out clean. 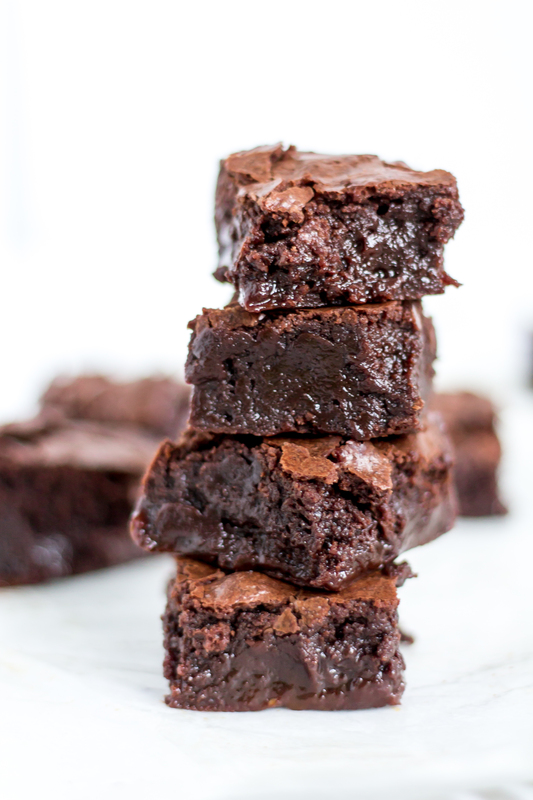 Right after you remove the brownies from the oven, place them directly into the fridge and chill for about 1 hour before slicing. 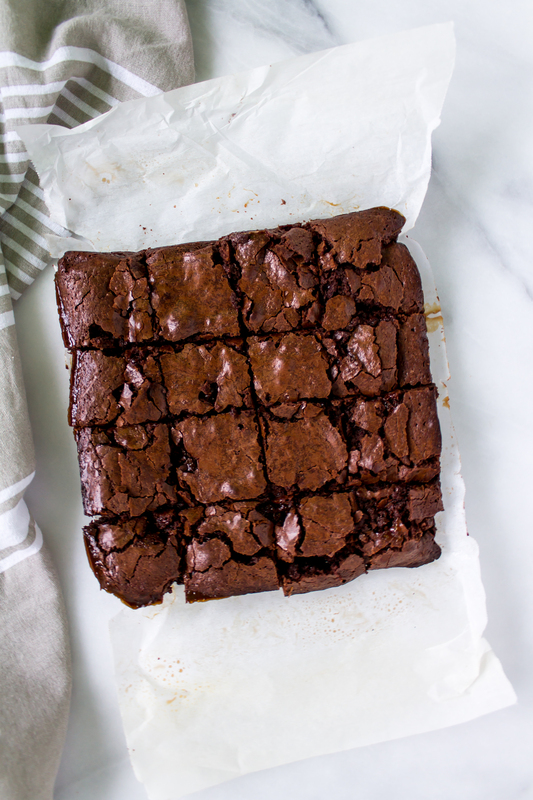 When they are cool, remove the brownies from the pan by lifting the parchment paper “handles” on either side, place them on a cutting board, and cut into squares.